I would definitely stay at this hotel again. Especially for the price I paid! Decor was nice. Staff was helpful. Very clean. I had a hard time finding my way to and from the hotel but that?s my fault! 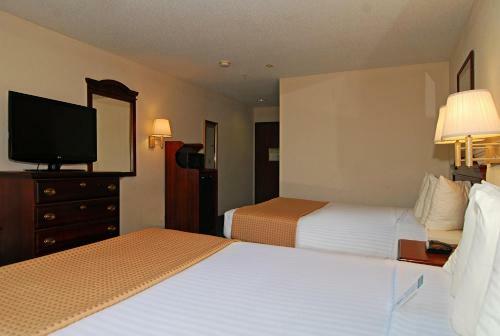 The 67-room Best Western Fountainview Inn and Suites is close to Houstons Galleria shopping complex and has affordable rooms equally suited to families on vacation or the business traveler. Items included with the room rate at this three-story hotel are a continental breakfast, high-speed Internet access, local telephone calls and parking. There is meeting space available for business or social functions that can accommodate 50 guests. Area landmarks and attractions include the Compaq Center, Minute Maid Stadium, the Houston Natural Museum, the George Brown Convention Center, the Houston Zoo, Six Flags Astrodome, the Houston Medical Center, the Sam Houston Race Track, Space Center Houston, the University of Houston and Rice University. All the rooms and have a work desk with high-speed Internet access, television with cable news and movie channels, an AM/FM radio-alarm clock, coffeemaker, iron and ironing board, hairdryer and a telephone with voicemail. 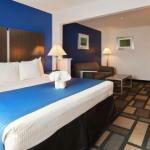 Some rooms have the added benefits of a microwave oven and a refrigerator. 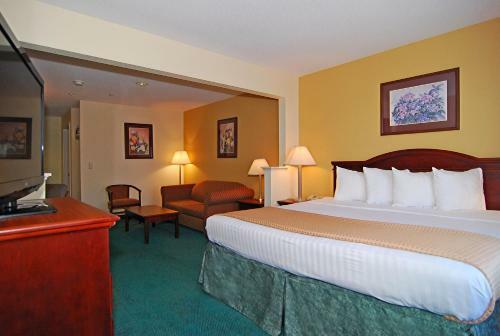 Handicap accessible rooms and non-smoking rooms are available. This hotel has an outdoor swimming pool, whirlpool and an exercise facility. The 24-hour front desk has information on area events and attractions. Other amenities include a business center, laundry and dry cleaning services, a car rental desk, daily housekeeping and ice and vending machines. The complimentary breakfast is the only meal served here. Restaurants nearby include The Brewery which is across the street from the property, the Cabo Grill, a Ruths Chris Steakhouse, Joes Crab Shack, Dennys, the Thai Gourmet and an Outback Steakhouse. This is not the best Best Western in Houston but several clients said it offered good value and so we allow the property the YES rating. There were some complaints that the property was not in the best of areas but families said it was only a short drive to the Houston Zoo and the Six Flags theme park. Some guests said they would stay here again while others said they would be looking elsewhere the next time they came to town.